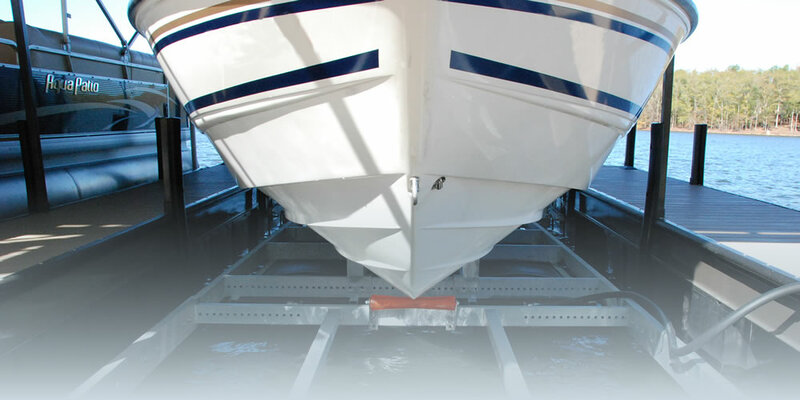 Carolina Lift Systems builds custom boat lifts for boating enthusiasts in SC, NC, Georgia, and throughout the Southeast, earning a reputation for the most stable and durable boat lifts in the industry. 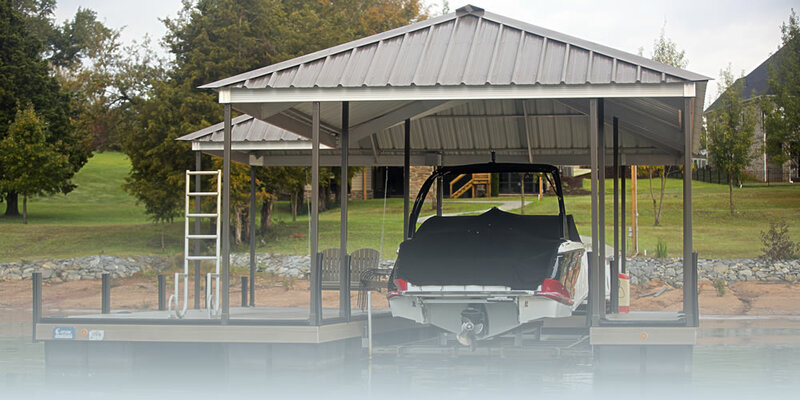 Carolina Lift Systems designs and builds the highest-quality and most durable boat lifts in the industry. 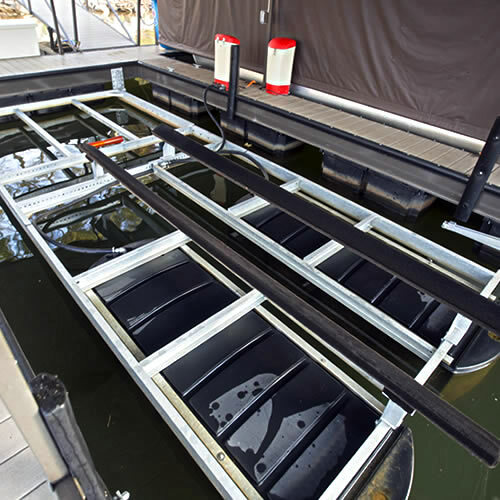 The Carolina Lift Systems boat lift was designed out of a need for a better boat lift for the Southeastern lakes. 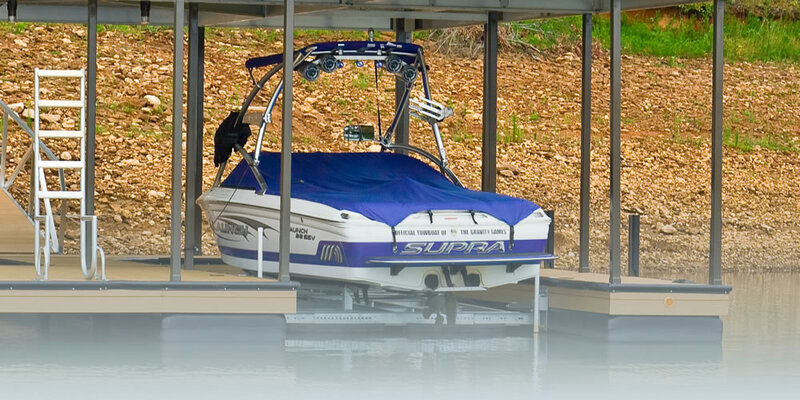 It has become known as the most user-friendly, stable, and durable boat lift in the industry. The Carolina Lift System is a water/air-displacement design with a unique up-pressure, locking-arm mechanism (patent pending). This innovative design eliminates the bouncing, squeaking, and attachment fatigue of our competitors' lifts, as well as adding stability to the dock system, a huge benefit for lighter-weight aluminum docks. Because of the Carolina Lift Systems' heavy duty, all-welded construction, it is the number-one choice for rough-water locations. 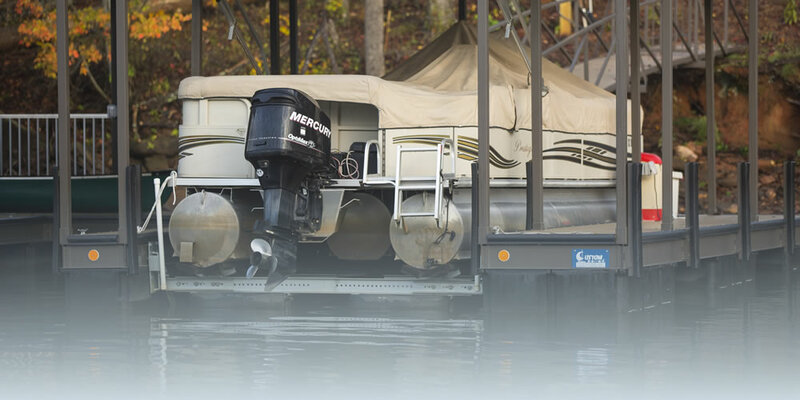 The up-pressure also offers the ability to lock the lift in the "up" position, which gives you complete peace of mind that the boat cannot be lowered in your absence. 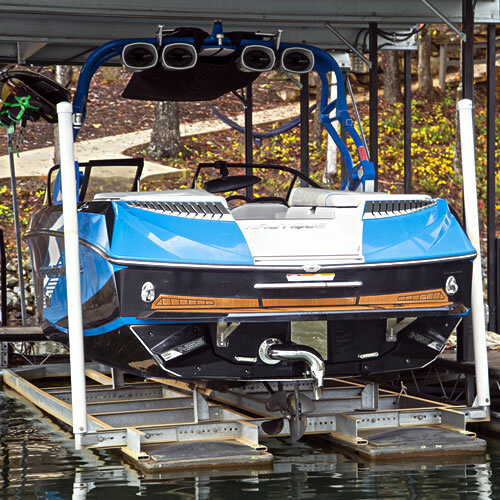 The bow areas of the Carolina Lift System can be decked to add a storage area or standing surface for applying or removing boat covers. All the steel components of the Carolina Lift System are hot-dipped galvanized after fabrication, assuring the highest possible quality. The lift is installed with all galvanized sections above water, eliminating surface deterioration and costly repairs. 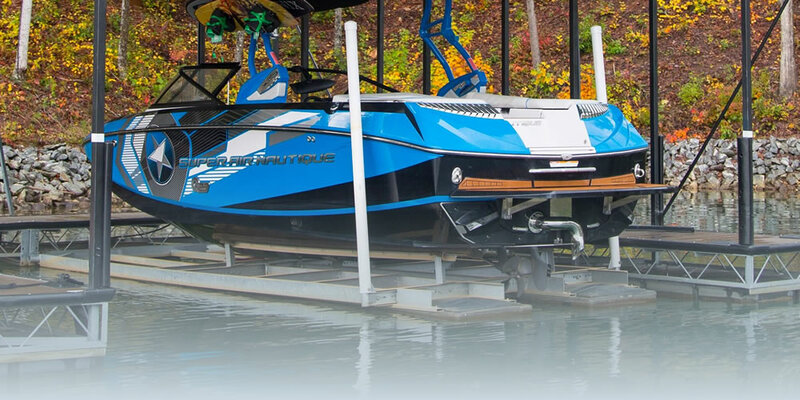 Beyond our standard line of lifts, we offer custom builds in lift capacity and boat-bunk configurations. 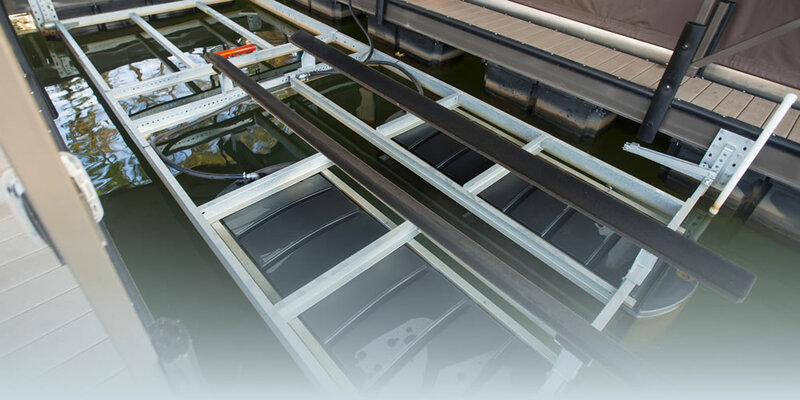 If you require a user-friendly, stable, durable boat lift that offers rough-water protection and more pounds of lift per dollar of cost, contact us for a Carolina Lift Systems boat lift. 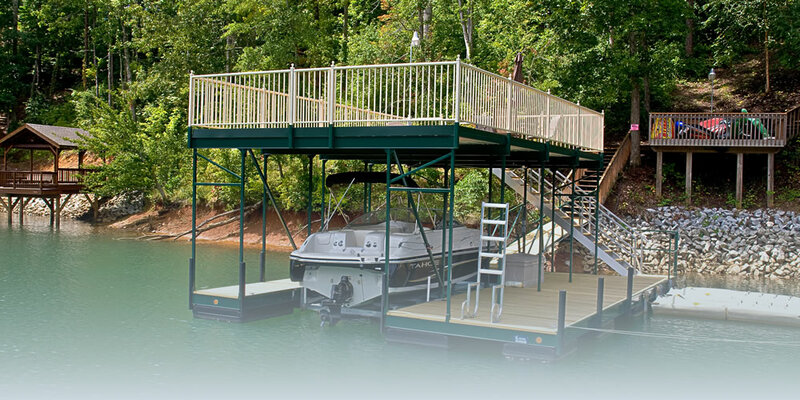 Carolina Lift Systems designs, builds and installs the highest quality boat lifts available today. For the ultimate in custom boat docks, visit our sister company Custom Dock Systems. 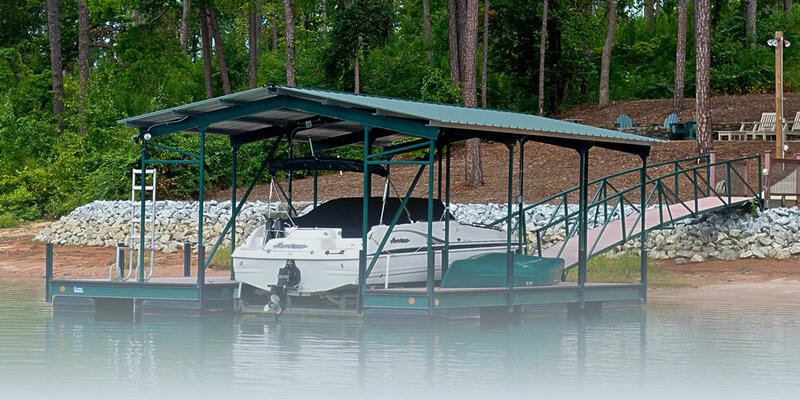 Custom Dock Systems is the Southeast's leading manufacturer for aluminum and steel boat docks on Lake Hartwell, Lake Jocassee, Lake Secession, Lake Greenwood, Lake Thurman, and lakes throughout Upstate South Carolina and North Georgia. Custom Dock Systems has been building all levels of dock systems for more than 45 years, including platform docks, uncovered slips, covered slips, sundeck roof docks, and commercial multi-slip docks all with a variety of decking options. Custom Docks Systems also provides dock permitting, dredging, erosion control, dock repair and restoration, dock moving and relocation, commercial marinas as well as custom dock design and fabrication. Visit them online at CustomDockSystems.com. Web Design Greenville SC by Stratatomic. ©Copyright Stratatomic LLC. All rights reserved.